Home | Resources | Helping Your Teen | What’s a Recovery High School and How Does it Help? What’s a Recovery High School and How Does it Help? A recovery high school is specifically for students that are recovering from addiction. 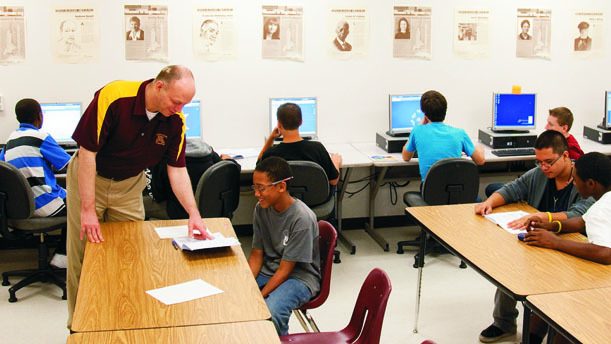 They meet all curriculum requirements in its state, providing students with a high school diploma upon completion. Some studies suggest that 60 to 70 percent of teens who are in recovery from addiction relapse after returning to their high school. Enrolling in a recovery school provides them with adequate support for their transition out of rehab and into continued recovery. As of 2013, there were 25 recovery schools operating in the United States. Here are a few other things you might want to know about recovery high schools. This depends on the school. In some states, the schools are funded by the school district and the state’s Department of Public Health. For others, they are either privately funded or families pay tuition. In many cases, financial support is available. Each school operates differently, although their general philosophies are the same. They are usually small, with an average of 30 students. This allows the maximum amount of care and support for recovering teens. The curriculum is taught differently from school to school, but they all meet state requirements. The school staff includes therapists, recovery counselors, mental health professionals and teachers. How Do Recovering Teens Benefit? There are many ways that a recovering teen can benefit from attending a recovery high school. Firstly, their curriculum might be personalized to meet their needs to complete graduation. Secondly, relapses are often treated with a degree of support and concern, rather than simply with punishment. Thirdly, students might feel more supported by the peers rather than stigmatized. Recovery schools help students feel proud of their accomplishments in recovery rather than shame in their addiction. Conditions for enrollment vary between schools but often students can be referred by their own high school, parents, treatment programs or through a court order. They typically have to have been clean and sober for a minimum period of time, averaging around 30 days. If your teen is still struggling with their addiction, contact us any time of day at 866-382-6651 locally, or at +1-310-933-4408 internationally to get in touch with our staff.